There has been a recent popularity of working FM satellites with the Arrow Satellite Antenna and a handheld radio. Its just kinda tuff doing it with one hand pointed up towards the bird. So I came up with a 12vdc simple azimuth and elevation motor unit that fits on a camera tripod. I have a bunch of videos posted on YouTube. You can click on the link at the end of this page to see a few of them or search YouTube with KA6PUW. Thank you AMSAT India for publishing the design in your March 2009 Newsletter. 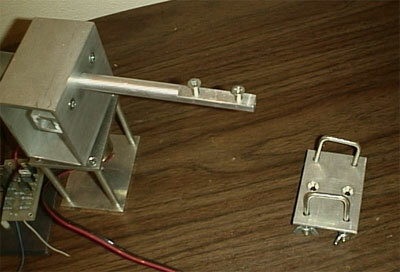 Here is a picture of the first prototype I built. 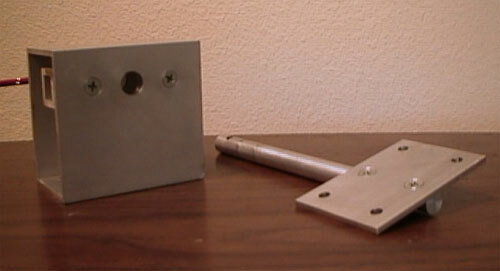 The base consists of 4 3" aluminum standoffs and some scrap aluminum cut to 2 1/2"x 3" rectangle. KB7RSI emailed with some news. 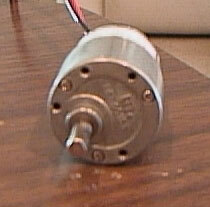 There is a 1 RPM motor available from ServoCity.com As far as I can tell it's the same type as the Hsiang-neng but they do not give a manufactures name. They do show all complete dimensions and they seem to be indentical. I have NOT tested one yet and I will post the information ASAP. So hold off on ordering one yet. Also KB7RSI pointed out the 3" aluminum standoffs are available from them. 3.00" Part# 534-3000 $1.75 ea. I have had a hard time to locate these standoffs locally in the Los Angeles area. I am sure they are out there at a reasonable price. Thanks Harold. It has an offset shaft from the gearhead and a 5.9 mm shaft. 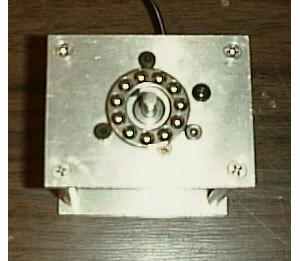 The screw holes for mounting the motor are M3 x .5 metric. Here is a picture of the top plate. The hole for the motor is 15/32". 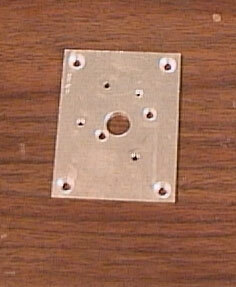 The bottom plate has a 1/4-20 threaded hole for a standard camera mount. You can see the 3 capend bolts for the bearing mount. 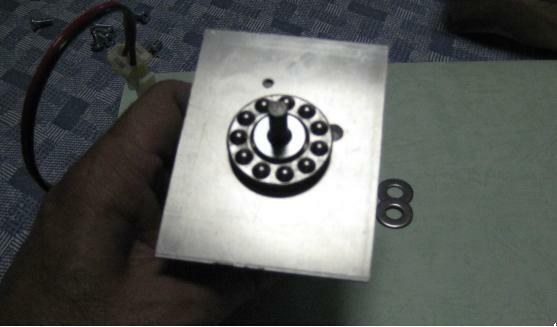 Picture of the top plate with the motor mounting holes and the capend bolts holes for the thrust bearing. I had to use a bearing because there was too much shaft play and the elevation unit would wobble. I changed the bearing support so you don't have to drill and tap 3 extra holes and screw in the cap end bolts. 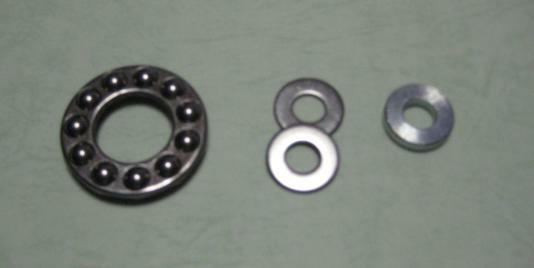 I used 2 washers or a 5/8" OD diameter spacer from ACE Hardware. Here is picture with the 5/8" OD spacer installed. Next is the elevation motor mount. The 3/4" square stock was added as a cheap support bearing. Its possible to do without this piece. The small piece of aluminum on the bottom is for attaching the azimuth motorshaft. Here is another side view with the elevation shaft in place. 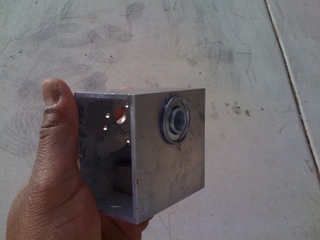 Here is a side view showing the shaft hole. 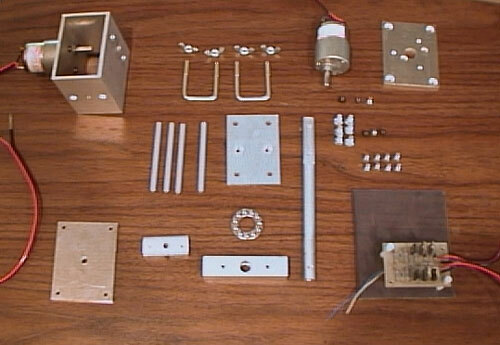 Here is a photo showing all the parts. 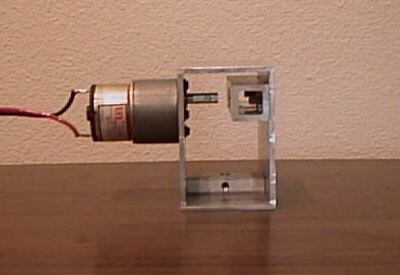 Simple Motor control with a DPDT switch. 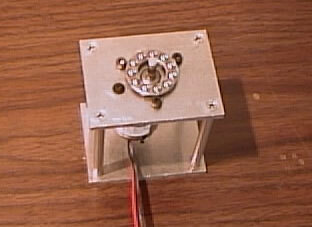 I have a Youtube link if you would like to see it working with a 12 vdc H Bridge and Parallax BS1 Basic stamp. Any help in programing P basic for AO-51 tracking would be appreciated. I am getting a lot of questions on the H bridge, I am using a JCMINventures.com Dual motor H bridge. You can use any similar type or make your own. 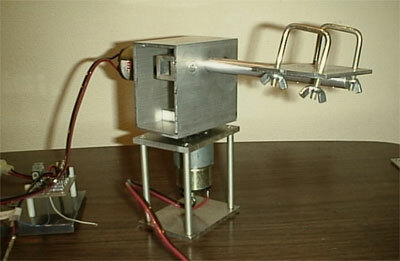 Harold KB7RSI has made many suggestions and will be testing one unit. These motors have great torque - on the ServoCity motor page they warn if the shaft stops turning damage can occur in the reduction drive gears. They are very strong. I am getting requests to sell a complete unit but I am more thinking to make a partial kit available for a short time. 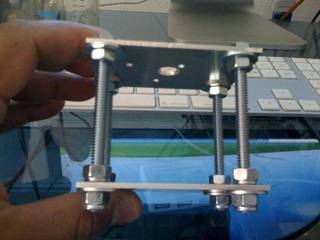 So far I am unable to find a source for the 2"H x 1.25"W x 1/8" square U bolts. I need to find a tapered head M3 METRIC machine screw source nearby. There would be restrictions in payment because I do not want to deal with checks or cash. So I am thinking about putting them on EBAY with PayPal check out only. These partial kits would have the intention for you to try and hook it up to a tracking controller. Any feedback would be appreciated. So what else is up? Well I got some email about Mode V/S. 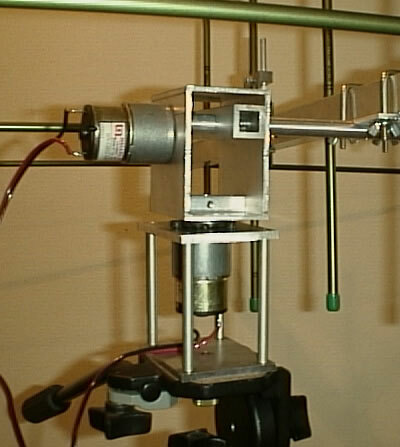 The mounting plate for the 2/440 yagi has to be made longer so you could attach a small 2.4ghz antenna or a California Amplifier 130099 type downconverter. Pictures soon. Some comments about using the azimuth elevation rotor with a tracker unit. Some require feedback for position. Some of the PIC types may use a 10K pot. 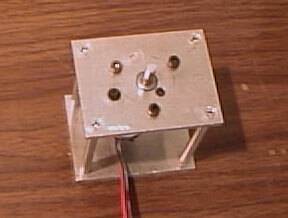 (any potentiometer could be used) I need to come up with a pan/tilt type version. Please send me your ideas and comments.